Unlike the early Babylonians, whose day began with sunrise, the Jews began theirs with sunset. 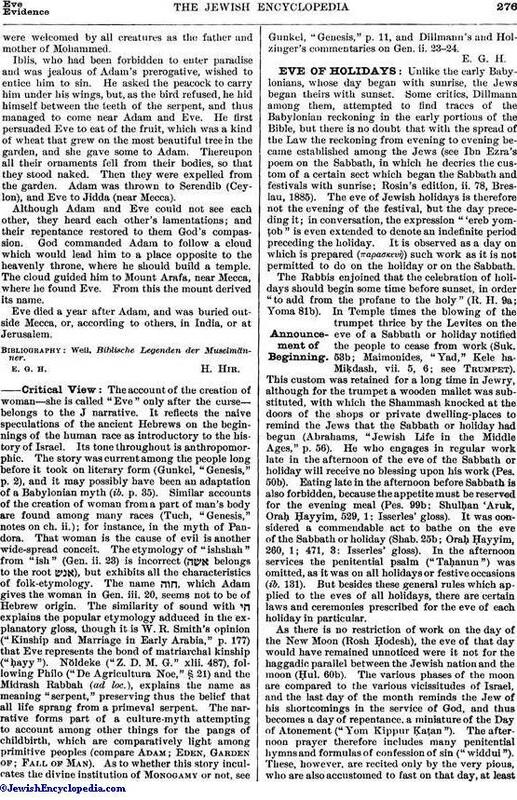 Some critics, Dillmann among them, attempted to find traces of the Babylonian reckoning in the early portions of the Bible, but there is no doubt that with the spread of the Law the reckoning from evening to evening became established among the Jews (see Ibn Ezra's poem on the Sabbath, in which he decries the custom of a certain sect which began the Sabbath and festivals with sunrise; Rosin's edition, ii. 78, Breslau, 1885). The eve of Jewish holidays is therefore not the evening of the festival, but the day preceding it; in conversation, the expression "'ereb yomṭob" is even extended to denote an indefinite period preceding the holiday. It is observed as a day on which is prepared (παρασκευὴ) such work as it is not permitted to do on the holiday or on the Sabbath. The Rabbis enjoined that the celebration of holidays should begin some time before sunset, in order "to add from the profane to the holy" (R. H. 9a; Yoma 81b). In Temple times the blowing of the trumpet thrice by the Levites on the eve of a Sabbath or holiday notified the people to cease from work (Suk. 53b; Maimonides, "Yad," Kele ha-Miḳdash, vii. 5, 6; see Trumpet). This custom was retained for a long time in Jewry, although for the trumpet a wooden mallet was substituted, with which the Shammash knocked at the doors of the shops or private dwelling-places to remind the Jews that the Sabbath or holiday had begun. (Abrahams, "Jewish Life in the Middle Ages," p. 56). He who engages in regular work late in the afternoon of the eve of the Sabbath or holiday will receive no blessing upon his work (Pes. 50b). Eating late in the afternoon before Sabbath is also forbidden, because the appetite must be reserved for the evening meal (Pes. 99b; Shulhan 'Aruk, Oraḥ Ḥayyim, 529, 1: Isserles' gloss). It was considered a commendable act to bathe on the eve of the Sabbath or holiday (Shab. 25b; Oraḥ. Ḥayyim, 260, 1; 471, 3: Isserles' gloss). In the afternoon services the penitential psalm ("Taḥanun") was omitted, as it was on all holidays or festive occasions (ib. 131). But besides these general rules which applied to the eves of all holidays, there are certain laws and ceremonies prescribed for the eve of each holiday in particular. As there is no restriction of work on the day of the New Moon (Rosh Ḥodesh), the eve of that day would have remained unnoticed were it not for the haggadic parallel between the Jewish nation and the moon (Ḥul. 60b). The various phases of the moon are compared to the various vicissitudes of Israel, and the last day of the month reminds the Jew of his shortcomings in the service of God, and thus becomes a day of repentance, a miniature of the Day of Atonement ("Yom Kippur Ḳaṭan"). The afternoon prayer therefore includes many penitential hymns and formulas of confession of sin ("widdui"). These, however, are recited only by the very pious, who are also accustomed to fast on that day, at leastuntil after the afternoon service (Oraḥ Ḥayyim, 417; comp. "Magen Abraham" and " Be'er Heṭeb" ad loc.). While the special additional prayers ("seliḥot") are recited before dawn during the week preceding New-Year's Day, the prayers for the day before New-Year's are much more numerous and are recited with greater contrition. The hymn commencing with the words "Zekor Berit" (Remember the Covenant) is included in these prayers, and the day is frequently designated by the initial words of that hymn. It is also customary to fast on that day, or at least until noon, although pious Jews fast the greater part of the ten penitential days (Tanḥuma, Emor, 22; Oraḥ Ḥayyim, 581, 2). It is different, however, with the eve of the Day of Atonement. Not only is it forbidden to fast on that day, but feasting is encouraged; it is said that he who eats and drinks on the eve of the Day of Atonement will be rewarded as if he has fasted both days (Yoma 81b; Oraḥ Ḥayyim, 604, 1). The early prayers for that day are also considerably reduced, and after the morning service a repast prepared by the congregation is served in the synagogue for the purpose of establishing a feeling of general fellowship. Each one begs the forgiveness of those he has wronged during the year. See also Kapparot and Malkut Schlagen. The meal taken before sunset should consist of light dishes, easily digestible, so that the evening prayer can be recited with devotion. A certain solemnity usually prevails in every household during this meal, after which the parents bless the children and immediately repair to the synagogue. This meal should be concluded before twilight sets in (ib. 604-608). 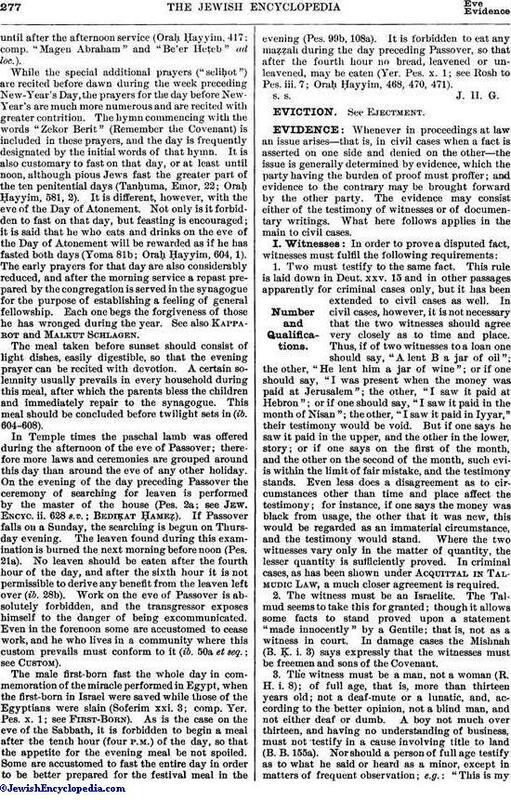 In Temple times the paschal lamb was offered during the afternoon of the eve of Passover; therefore more laws and ceremonies are grouped around this day than around the eve of any other holiday. On the evening of the day preceding Passover the ceremony of searching for leaven is performed by the master of the house (Pes. 2a; see Jew. Encyc. ii. 628 s.v. ; BediḲat ḤameẒ). If Passover falls on a Sunday, the searching is begun on Thursday evening. The leaven found during this examination is burned the next morning before noon (Pes. 21a). No leaven should be eaten after the fourth hour of the day, and after the sixth hour it is not permissible to derive any benefit from the leaven left over (ib. 28b). Work on the eve of Passover is absolutely forbidden, and the transgressor exposes himself to the danger of being excommunicated. Even in the forenoon some are accustomed to cease work, and he who lives in a community where this custom prevails must conform to it (ib. 50a et seq. ; see Custom). The male first-born fast the whole day in commemoration of the miracle performed in Egypt, when the first-born in Israel were saved while those of the Egyptians were slain (Soferim xxi. 3; comp. Yer. Pes. x. 1; see First-born). As is the case on the eve of the Sabbath, it is forbidden to begin a meal after the tenth hour (four P.M.) of the day, so that the appetite for the evening meal be not spoiled. Some are accustomed to fast the entire day in order to be better prepared for the festival meal in the evening (Pes. 99b, 108a). It is forbidden to eat any maẓẓah during the day preceding Passover, so that after the fourth hour no bread, leavened or unleavened, may be eaten (Yer. Pes. x. 1; see Rosh to Pes. iii. 7; Oraḥ Ḥayyim, 468, 470, 471).